Lost your Peugeot car keys? Snapped your key in the ignition and need a replacement Peugeot key? Need a Peugeot key fob reprogramming? Lost Your Peugeot Car Key and Need A Replacement or Spare? Supplying, cutting and programing Peugeot car keys across the West Midlands, Car Key Assist provide the most reliable auto locksmith services possible. 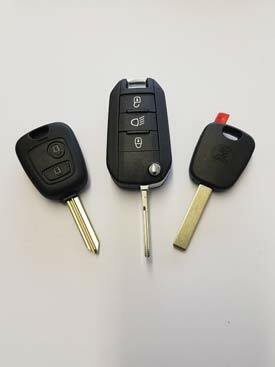 Working with a range of Peugeot vehicles, including key remotes for models such as 106, 107, 108, 203, 207CC, 207SW, 301, 306, 307, 307CC, 308, 308CC, 308SW, 309, 405, 406, 407, 508, 607, 806, 807, 1007, 2008, 3008 and 5008. Expert car key cutting and replacement services available 24 hours a day, 7 days a week, we are committed to helping our customers exactly when they need us, offering our vehicle locksmith service at the roadside, your place of work or your home address. As well as cutting replacement Peugeot keys to existing locks, we can also open locked Peugeot vehicles, erase keys from immobiliser and remove broken keys from ignitions and door locks.